I don’t know about your area, but around here the cold and flu season has been AWFUL this year! We don’t do flu shots, so we try to be vigilant about hand washing and taking whatever immune boosting and virus preventing measures we can: plenty of fermented foods and foods high in vitamins C, D, and zinc, essential oils, etc. Still, we’ve endured a couple of bugs in our family already this year. Thankfully, they’ve only lasted a couple of days and haven’t been too severe. The hardest hit was Karate Kid (12), who spent several days down for the count with aches, chills, fever, and a cough. During the time he was sick, a good friend mentioned to me a tip another friend had given her. She told me that the rest of us ought to use hydrogen peroxide in our ears as a preventative so we didn’t catch what he had. All that’s needed is a bottle of ordinary, 3% hydrogen peroxide – the kind that can be found at any drugstore – and a dropper. Put 3 or 4 drops in the ear canal and leave it for 5 to 10 minutes, until the bubbling subsides. Drain it on a tissue, and repeat with the other ear. This can be repeated every few hours until symptoms subside, or for a day or two after you know you’ve been exposed. That’s all there is to it! The theory is that the peroxide kills any germs and infection that have entered through the ear canal. If caught soon after exposure but before symptoms develop, it can be nipped in the bud, and even after symptoms have developed, it will reportedly shorten the duration at least 80% of the time. Some of the testimonies I read claim it’s very effective for ear infections also. I thought it was a very interesting and plausible theory, and definitely worth trying! I administered it to Karate Kid and the rest of the family. A couple of other family members had slight sniffles and coughs, but no one else got as sick as he had been, and he began to feel better by the next day. Since then, whenever there’s been a chance of exposure, or known exposure, I’ve tried to make sure each family member gets the treatment at least once. So far we’ve all stayed healthy. When you do it, you’ll want to explain to children ahead of time: it will feel cold, and even tickly and bubbly. They say it can sting slightly – it never did for me, but a couple of my other family members said it did. My younger kids think it’s funny, giggling while it fizzes and asking to be next when they see it being done to their siblings. What I find interesting is that sometimes it fizzes and foams like crazy and other times, there’s virtually no fizzing! My family’s experience is definitely anecdotal, but this treatment is cheap, easy, and certainly can’t hurt! It’s become a permanent part of our cold and flu prevention regimen. If there’s a possibility that we can prevent or shorten the duration of any kind of upper respiratory virus we encounter for pennies and in minutes a day, we’re going to give it a shot! Do you have a favorite go-to remedy and/or preventative for the cold and flu season? Linked with Thank Goodness It’s Monday, Natural Living Monday, Mostly Homemade Mondays, Titus 2 Tuesday, Titus 2sday, Teach Me Tuesday, Works for Me Wednesday, Raising Homemakers, Welcome Home Wednesday, Proverbs 31 Thursdays, Simple Lives Thursday, Hearts for Home, Graced Simplicity, Thrive at Home, Heart Filled Fridays, Essential Fridays. Thanks for sharing this! Our family has been hit with this nasty flu and would have loved to know this before. It hit my 2 year old daughter the hardest…feel so bad for her. I love anything that will prevent these illnesses and trips to the doctor. You’re welcome, Laura! I hope it comes in handy for you. I wish it had been in time to help this time around! Praying your sweet girl feels better quick! Very interesting and like you said, can’t hurt. I’ll pass it on to my kids and their families. Mel Caldicott recently posted…Being a Christian Seems Too Easy Nowadays! I have to tell you my even easier way. 🙂 It involves 2 Q-tips per person, though. (Per person) dip all 4 ends into the H2O2. Put a clean dipped end into each ear canal and each nostril. My kids like this a little better because they don’t have to deal with the cold of the H2O2 and the bubbling, just the bubbling sound. It also takes care of the nasal passages, which are just as vulnerable as the ears. I only wish that I had remembered this BEFORE we all fell ill with the crud. That’s an excellent suggestion, Amy! Thanks! 🙂 I hope y’all are all starting to feel better now. We’ve been fighting a bit of crud here too this week, but not to the extent y’all have! Hello there, I have enjoyed your article. I have been using this treatment for years and years. I am here to tell you that it does work absolutely. Most years we go without having a bug in the house. One thing that we also do is gargle with the hydrogen peroxide. If you don’t want to gargle with the drug store stuff you can get the food grade stuff from the health food store, just be sure to dilute it down. But your right the trick is to catch it as soon as you notice that little scratchy tickle in your throat or ears. Another trick is to be sure to hit the scratchy spot when you gargle, you might have to move your tongue from side to side to get it down far enough. Even if you drink a little it won’t hurt you. After you spit, close your mouth and open the back of your throat like you are about to yawn. You know that point when you can hear your breathing in your ears. Breathe into your ears like that for a while to get those vapours still in your throat up in to your ears. I know this may sound wonky but it is easier to do than describe. If you do this every time you get those scratchy tickles you will be golden. I’ll have to try this next time we’re around sniffles. Hi! 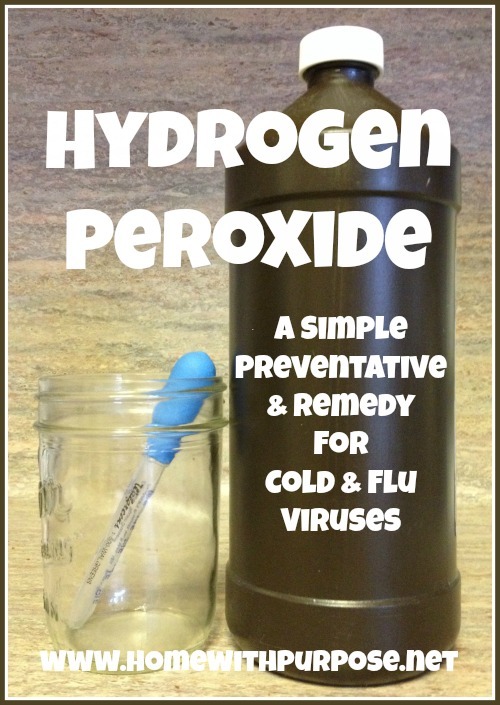 Found this through a Pinterest link and thought I’d share my absolute favorite use for Hydrogen Peroxide — it’s to treat cold sores. I saturate a cotton swab in it and then dab it on the cold sore. It fizzes up, it sometimes stings (depending on the severity of the sore) but it dries it up like nothing I’ve seen, including Abreva. I can get rid of a cold sore in 1 or 2 days with this method!